It’s that time of year again. Summer has arrived and that means it’s time to fire up the grill and cook all your family favorites outdoors. That’s easy to do with the all new Smoke Hollow 8500 Liquid Propane Combination Grill that offers a variety of cooking options for your favorite summer evening meals. Bring all your friends and family over for a delightful cookout using this very versatile tool for your backyard parties. Whether you want to use charcoal to give the food a delicious smoky taste or you want to cook something faster during the work week with the gas side, this cooker has you covered! We especially like this model for its large size which means it can store a lot of goodies down below on the sturdy shelves. It does have a large footprint but in exchange you get lots of cooking space with this model. Some people enjoy the ease of the gas grill. You can light the burners, throw your food on the grates and have dinner on the table in no time. All of this while you’re enjoying the outdoors with your family. The Smoke Hollow 8500 offers a side of the grill that is gas powered and has 3 10,000 BTU stainless steel tube burners that allow you to cook all your favorite foods. There is an easily removable grease tray allowing you to clean the grill quickly after cooking. Also, all of the flare guards and the warming rack are porcelain coated so that your grill is protected. While gas is quick, simple, and efficient, many people choose to use the charcoal side of the Smoke Hollow grill. There’s simply nothing like the taste and flavor that charcoal can add to your grilled foods. The charcoal side of the grill also offers porcelain-coated, cast iron cooking surfaces to help protect your grill and give you an even cooking. The basket that contains the charcoal during cooking is easily adjustable to make sure you get the right amount of fire and warmth for your dinner. The removable trays for the ash drawer and grease drawer make it easy to keep the grill clean and in pristine shape. The Smoke Hollow 8500 LP is a very versatile cooking tool to add to all your backyard parties. Whether you’re wanting to charcoal, gas grill, sear food or smoke, you have the option with this new equipment. The grill offers you all you’d ever need when it comes to your backyard BBQ’s. At the time of this writing, there are 13 customer reviews on Amazon sharing their thoughts on the grill as well. Those who have bought and used the grill give it a 3.3 out of 5 stars. The consensus on the Smoke Hollow 8500 LP Gas/Charcoal Grill is a resounding two thumbs up. The reviews share a point that you need to buy a fire barrier caulk item when you first purchase the grill to help seal it up. However, this is only from one reviewer on Amazon so it may not be something that everyone who purchases the grill believes in. Overall the reviews are amazing and share that this is a great addition to any avid griller’s backyard setup. With multiple options to choose from, it’s easy to see why this grill is a top-rated item on Amazon and other sites as well. 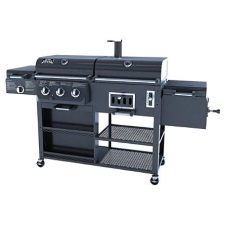 In conclusion, the Smoke Hollow 8500 LP Gas/Charcoal Grill with Firebox is a great item to purchase and add to your backyard patio or kitchen. You have many options to choose from whether you need a quick meal during the week or you want to cook something low and slow over the weekend. Smoking meat, searing veggies or grilling up a fantastic steak is easy to do with this highly ranked grill option.